[HD videos below] One of the many reasons that the Dell Precision line of mobile workstations are so popular, is that you can fully customise them at time of purchase and once you have one in your hands, it can easily be modified with just a suitable screwdriver and a little common sense. 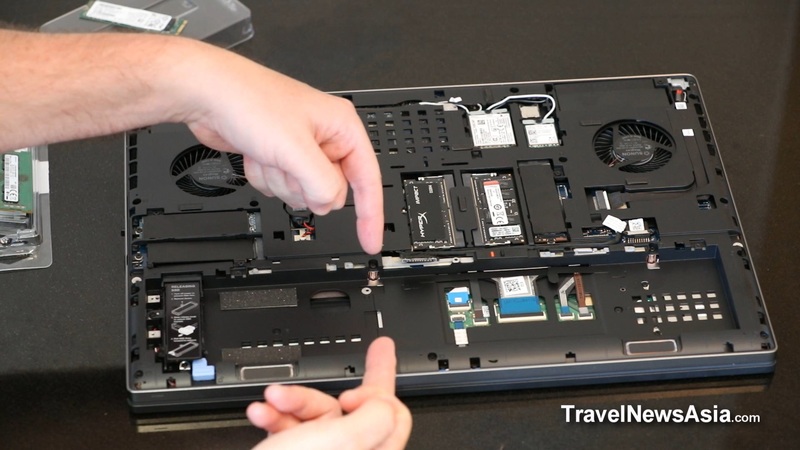 In this second video on the Dell Precision 7730 Mobile Workstation we show you how easy it is to open the back of the laptop to install/change RAM and/or the harddrives. The Dell Precision 7730 has up to four M.2 PCIe NVMe SSD slots and all of them are very easily accessible under the bottom lid of the laptop. Two of the four SODIMM RAM slots are also at the bottom of the laptop while the other two RAM slots require users to remove the keyboard and access them that way (a new video on that will be uploaded soon). In this video, filmed on 5 August 2018, you will see the internal layout of the Dell 7730 and discover just how easy it is to remove the battery cover and then the battery, unscrew the cover and install a new M.2 drive. See latest HD Video Interviews, Podcasts and other news regarding: Dell, Precision, 7730.